Families at the Marie House women’s refuge, for mothers and children fleeing domestic violence*, got to enjoy a weekend of enriching and exciting Easter fun. 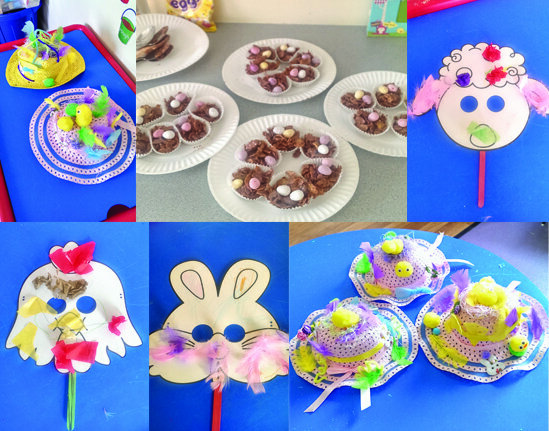 “In a play session we made Easter nests using cornflakes, which the children really enjoyed. They got to break up the chocolate, stir in the cornflakes, spoon the mix into the bun cases and add Mini Eggs to the top of each cake. “After that we decorated Easter animal face masks; the children could either colour them in or stick decorations on to their chosen mask. These were fixed to lollipop sticks for them to use more easily. “We also had a visit to the Xscape soft play area, where the children spent two brilliant hours playing on the slides, in the ball pool, and with the other soft play equipment. “On Easter Monday we held an Easter Egg Hunt, which both the children and their mums joined in with. Staff hid paper eggs and left a trail leading to different activities for the children to do, such as star jumps or hopping five times on one foot, before they could move to the next part of the trail. “Finally, we decorated pots with colourful stickers and planted sunflower seeds into them. Once they have started growing, we’ll plant them in the garden and have a sunflower race, seeing whose becomes tallest. “The children and mums enjoyed decorating their own unique pot and getting a little dirty when filling the pots with compost! It sounds like a wonderful weekend; to help more families who are escaping domestic abuse get their lives back, please donate today. *For this reason, the families declined to be photographed.